When I was young and tagged along with my Mom to do the grocery shopping we would grab ourselves a treat at the checkout stand…I would choose junior mints and Mom would choose a York Peppermint Patty. Somehow I think it was earlier than 1975 and we lived in the south. Can’t believe they have their own date !!!!!!!!!!! Hate them! Still a great post. What an interesting food blog you have! This is really entertaining, hehe. Thanks for subscribing to my health food blog! With so many candies having partially-hydrogenated oil in them (something we have vowed not to eat) I am ever so grateful to York for keepin’ it real! My absolute favorite candy for years. I think I need to go out and buy a peppermint patty! The picture of them looks amazing! Man, do I love peppermint patties. And the fact they are low in fat. I had a question. I know this lady, who is having jaw surgery and won’t be able to to chew. I figure everyone is bringing soup. Do you have any ideas as to what I could bring her to eat? Thanks. love the history of food! 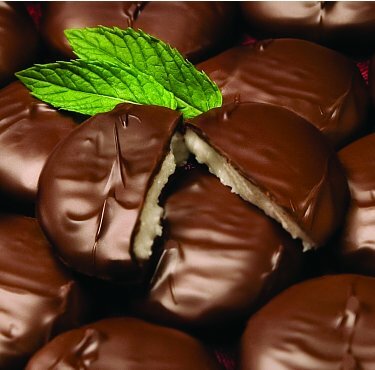 Chopped Peppermint Patties would make a good ice cream topping, or garnish for hot fudge sundae. I like peppermint patties. I wish I had an easy recipe which uses healthy yet tasty ingredients. A classic candy that will never go out of style … delicious! My step-mother-in-law, who loves to give presents, once gave me a Peppermint Patty serving dish. Honestly, there is such a thing. Now that I know that people in my half of the country (thank you John-Bryan and Food Find No. 2) weren’t allowed to even buy them until 1975, I am much more appreciative of the gift. Wow…the use of rBGH started in 1994. For some reason I was under the impression that there was a much longer history with regards to its use in farming. Concerned consumers and advocacy groups have done a lot with regards to awareness campaigns, etc. I am encouraged by this. There’s more work to be done, for sure, but progress is being made. Thanks for liking my clementine cake post! I love your facts – very fun! I am leaving now to go get some…lol. looks so wonderful, love peppermint! I adore peppermint patties but only the little ones. The big ones don’t have the right proportions of chocolate to minty goo. I had never heard of peppermint patties, or paddies, before. On the other side of the pond we call these peppermint creams, and they quite often don’t have chocolate on them. Excellent photograph, makes me want one right now.